BACKGROUND: The Ponseti technique of clubfoot manipulation and casting is reported to have almost eliminated the need for extensive surgery (posterior and posteromedial release) and surgical decision-making is now largely based on clinical assessment, as opposed to pre-operative radiographs. The Ponseti method of manipulation and casting was introduced at our institution in 2002, prior to which we used the Kite method. Both prior to, and following the introduction of Ponseti casting, surgical decision-making was based on pre-operative radiology, and intra-operative clinical assessment. METHODS: A retrospective comparative study was performed to compare the incidence of radical surgery following the use of the Kite method versus the Ponseti method. In addition, the accuracy of measured radiographic parameters in predicting which surgery was to be performed was investigated. RESULTS: The incidence of radical surgery decreased from 40% with the Kite method to zero with the Ponseti method. 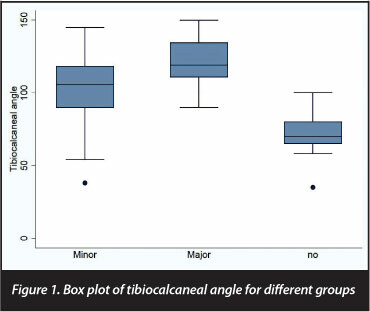 Of the four routinely measured radiographic angles, only the tibiocalcaneal angle and the talometatarsal angle significantly correlated with the extent of surgery performed. CONCLUSIONS: Using the Ponseti method greatly decreases the need for radical surgery in idiopathic clubfoot. Radiographic measurements do not influence surgical decision-making significantly. Most orthopaedic surgeons agree that the initial treatment for idiopathic clubfoot should consist of gentle manipulation and serial casting, with surgery being reserved for resistant and relapsed feet.1-3 Many methods of manipulation and casting have been described, with varying degrees of success. Ponseti reported 74% good to excellent results using this method, although 40% of patients required Achilles tendon lengthening, and 46% tibialis anterior transfer for dynamic forefoot varus, the tibialis anterior transfers performed after the age of 2.5 years.14 Subsequent studies showed superior results to previous methods with the need for radical surgery being almost completely eliminated. In this study the Ponseti method of treatment for idiopathic clubfoot was introduced in 2002. Prior to this, serial manipulation and casting was performed in the method described by Kite.5 PMR was performed on those feet that displayed inadequate talocalcaneal divergence (<20°) on pre-operative radiographs, or intra-operatively, where persistent cavus and hindfoot varus was evident after posterior release had been performed. It was noted that since adopting the Ponseti method of manipulation, the rate of major surgery (PMR) as primary surgical intervention for idiopathic clubfoot, decreased significantly. The purpose of this study is to quantify retrospectively the change in incidence of major surgery since the introduction of the Ponseti method. Additionally, the value of pre-operative radiographs was assessed as a tool for predicting the extent and complexity of surgery, i.e. PR vs PMR. A retrospective review of the clinical records and radiographs of all patients presenting to our clubfoot clinic was performed. Two cohorts were identified; those from 1999-2000 (pre-Ponseti) and those from 2009-2010 (Ponseti).The groups were chosen to represent patients preceding and following the introduction of a different plastering technique introduced in 2002. Patients were included in the study if they had idiopathic clubfoot, presented within the first three months of life and had received no prior treatment. Teratological clubfeet were excluded. Ethical approval was obtained from our institution's Research Ethics Committee. In the pre-Ponseti group there were 60 patients with 85 clubfeet. There were 24 females and 36 males; 25 were bilateral, 19 were left-sided and 16 were right-sided. Average age at presentation was 4.2 weeks (range 1-12 weeks), average number of plasters applied was 9 (range 0-18). Average age at first surgery was 10.3 months (range 3-44). In the Ponseti group there were 50 patients with 70 clubfeet. There were 16 females and 34 males; 20 cases were bilateral, 11 were left-sided, and 19 were right-sided. Average age at presentation was 4 weeks (range 0-12), average number of plasters applied was 7 (range 1-14). Average age at surgery was 6.7 months (range 3-18 months). The Chi-square test was performed to determine the significance of the change in rate of posteromedial release being performed as primary surgical intervention. In order to determine the predictive value of pre-operative radiographs in determining whether major surgery was to be performed, the data from both cohorts were pooled. This follows the fact that surgical decision-making for both groups was performed either by, or under the supervision of the same surgeon (EBH). The patients were divided into three groups as follows: major surgery (PMR), minor surgery and no surgery. Analysis of variance (ANOVA) tests were performed on the data sets that were normally distributed, and if the data was not normally distributed, the Kruskal- Wallis test of significance was performed. In the pre-Ponseti group 34 of the 85 feet (40%) had a PMR as primary intervention. Posterior release (PR) was performed on 41 feet (48%); three feet (4%) were treated with a percutaneous tenotomy; and the remaining seven feet (8%) required no surgery. The average pre-operative Carroll score was 8 for the patients treated with PMR, and 2.8 for patients treated with PR or lesser surgeries. In the Ponseti group, PMR was performed on no patients as primary surgical intervention. PR was performed on 32 feet (48%); 12 feet (17%) had formal elongation of the Achilles tendon (ETA); percutaneous tenotomy was performed on two feet only (3%); 18 feet (26%) required no surgery; and four patients were lost to follow up after initial presentation. The average Carroll score for patients undergoing PR was 3.8 and for patients undergoing ETA 2.4. The decrease in the rate of major surgery was found to be highly statistically significant using the Chi-square test (p<0.002). In addition the average Carroll score decreased from 6.8 in the pre-Ponseti group to 3.4 in the Ponseti group. 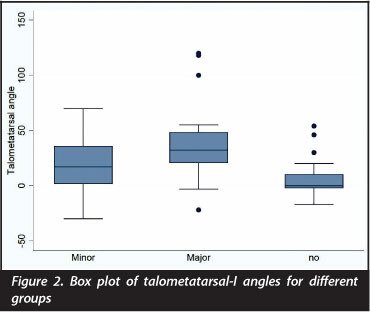 The average measured radiographic angles for the different surgical groups are summarised in Table II, and the results of the statistical analysis in Table III. The oneway analysis of variance was determined for all angles except the AP talometatarsal-I angle, for which the Kruskal-Wallis test was performed, as the data for this angle was not normally distributed. A p-value of 0.05 was chosen as the cut-off for significance. Graphic illustration of the distribution of measured angles in the different groups is provided in Figures 1-4. In this study, the average pre-operative Carroll score changed from 6.8 to 3.4 after the introduction of the Ponseti plastering technique. In addition, and more clinically relevant, 40% of patients in the group treated with the traditional manipulation and casting technique required PMR as primary intervention, whereas in the Ponseti group, not one PMR was performed as initial surgical intervention for idiopathic clubfoot. This result was found to be highly statistically significant using the Chi-square test (p<0.002). In contrast to these findings, in a similar review by Molteno and Colyn, 897 idiopathic clubfeet treated from 1978-2003 were evaluated. In their study the rate of PMR as primary surgical intervention, decreased from 85.1% to 64.5% after changing plastering techniques from the Kite method to the Ponseti method. They stated that this relatively high rate of major surgery is attributed to the nature of the patients attending their clinic, noting that patients had to travel hundreds of kilometres to attend the clinic, and that compliance was low, therefore necessitating more radical intervention at an earlier stage.21 The pre-operative criteria for determining the degree of surgery to be performed was not included in this study. 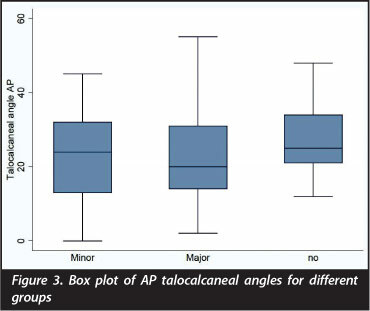 In our study, both the tibiocalcaneal angle and the AP talometatarsal-I angle were significantly related to the degree of surgery performed. Herbsthofer et al performed a statistical analysis in order to determine the significance of radiographic measurements in clubfoot. 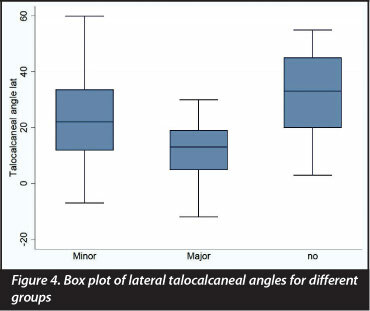 They found that clubfeet did have on average a smaller talocalcaneal (TC) angle (AP and lateral) but due to high standard deviations, definite assignment of angle measurements to healthy feet or clubfeet was not possible. They also felt that a differentiated distribution of clubfoot change according to degrees of severity based on the TC angle would make no sense. 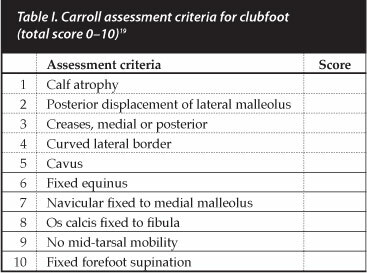 They concluded that the routine use of radiographic studies in the diagnosis, classification and follow-up of clubfoot does not appear to be a useful tool in view of the wide range of deviation of values within individual clinical groups.24 Radler et al concluded that, although there was generally poor correlation between radiographic measurements and clinical severity in clubfoot, X-rays were useful in diagnosing pseudo-correction and aiding decision to do a tenotomy.3 In our study, even though there was correlation between the tibiocalcaneal angle and the talometatarsal-I angle, radiography did not supersede the value of clinical evaluation in deciding the need for surgery and the extent thereof. We conclude that, based on our results and a review of the current literature, the Ponseti method of casting significantly reduces the need for major surgery in the treatment of idiopathic clubfoot, compared to traditional methods. We also suggest that the use of routine radiographs in the treatment of clubfoot does not appear to contribute to decision-making and is therefore not justified. The content of this article is the sole work of the authors. No benefits of any form have been or are to be received from a commercial party related directly or indirectly to the subject of this article. The research has been approved by the Research Ethics Committee, Health Sciences Faculty, University of Cape Town (ref: 349/2008).